We could not have asked for a better hotel than Hotel Santa Maria. This boutique hotel is in the heart of the popular area of Trastevere yet tucked between buildings to create the ultimate sanctuary in the middle of Rome. There are gorgeous outdoor courtyards where you can enjoy your coffee, and breakfast is included so you can fuel up for all the walking you’ll be doing. Our room was simple but cute, comfortable and clean. It’s perfectly situated where you can walk to all the major sightseeing spots, and bonus, there’s a sweet golden retriever named Chanel who hangs around and loves a good belly rub. 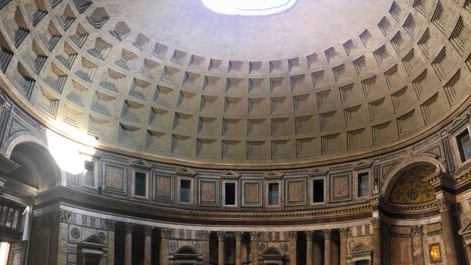 Obviously, there are the heavy-hitters that everyone wants to see like the Sistine Chapel and the Colosseum, but our favorite thing to see was the Pantheon. It’s a former Roman temple that’s now a church, and was completed in the year 126 AD. When we walked up it hardly looked real! The best part—it’s free to enter and the line moves really fast (if there’s a line at all). The inside is super unique with a giant hole in the dome that was built so the Gods could enter the temple. When it rains, it rains inside, and drains on the floor take in the water. 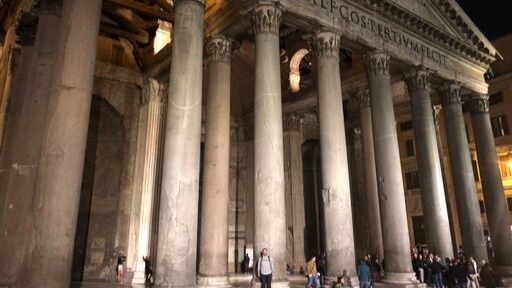 At night the Pantheon is lit up beautifully (though the doors to enter close) and it’s situated right in the middle of a cute square with a fountain and lots of surrounding restaurants. Our favorite activity of the trip was a pasta making class with a former Olympic diver turned professional chef! 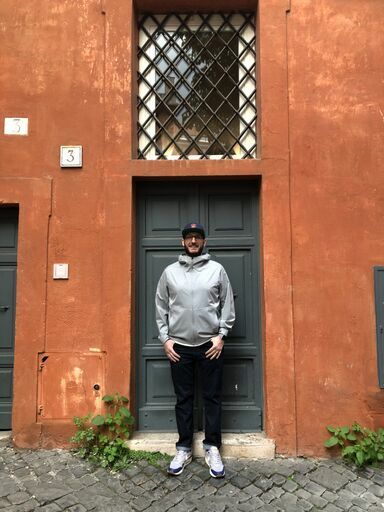 Unbeknownst to us, our Airbnb Experience host Alessandro is the top host in all of Italy and it definitely shows. 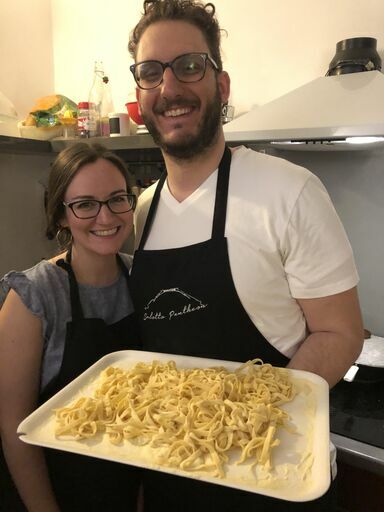 He invited us and two other people to a private lesson in his historic apartment and showed us the ins and outs of making fresh pasta. He was so warm, welcoming and entertaining, and the three types of pasta we made were SO DELICIOUS. I recommend doing this near the end of your trip otherwise none of the other pasta you eat will live up to it! By far the dish we ate the most was cacio e pepe. It’s a super simple but delicious pasta with thick noods, pecorino cheese and black pepper. 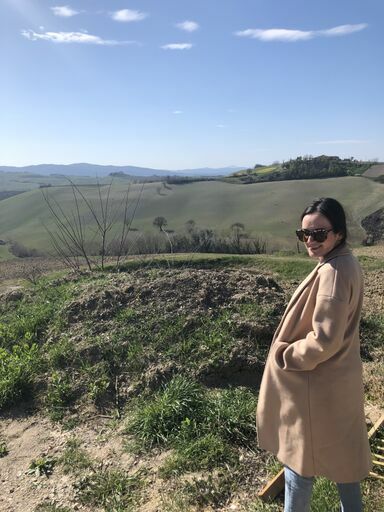 Italy is known for its pecorino cheese and it’s so damn good. You can also find cacio e pepe in other forms (like chips and pizza!) and I recommend ALL THE THINGS CACIO E PEPE. We were too busy eating to take any photos. In the area of Trastevere there’s a large hill with the gorgeous Fontana dell'Acqua Paola fountain at the top and an amazing view of all of Rome. It takes a lot of stairs and a lot of walking uphill to get there, but trust me, it’s worth it. While the fountain isn’t as grand as the Trevi Fountain, it’s still big and beautiful and WAY less crowded with tourists so you can actually enjoy it. From there you can also see all the amazing Roman architecture dotting the landscape. It’s v romantic at night! 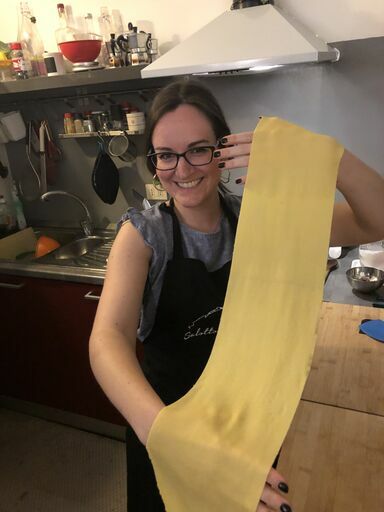 While you’ll find good pasta and pizza pretty much everywhere, our favorite came from a restaurant we happened to stumble upon in Trastevere called Da Massi. It’s classically Italian, incredibly charming with big doors that open to the bustling cobblestone streets and offers great food. We explored some trendier restaurants but found the traditional, no frills places to be the best. Again, too busy eating to take pics. The big tourist spots all have long lines to get in and, without a tour guide, it can be difficult to know and appreciate what you’re looking at. We did a guided tour of the Vatican Museum and the Sistine Chapel as well as a day trip tour to Tuscany. I recommend both, but in general, I highly recommend the group we used for both: City Wonders. Everything was very well organized, the guides were highly knowledgeable, and I definitely think both experiences were worth the cost. At night we enjoyed simply walking around Trastevere. Every night of the week there were tons of young people dining, drinking and just hanging out in the streets. This area is quintessential Italy with tight alleys and charming orange buildings and clothes hanging from lines. It’s fun to get some gelato, walk around and people watch. Over the course of our trip we learned a few tips and tricks. Keep these in mind if you’re traveling to Rome! This may go without saying, but you will do so. much. walking. Comfortable shoes are obviously a must but bring a couple pairs so you can switch up your shoes daily. It helps with foot fatigue. Don’t worry too much about trying to learn Italian. It’s good to know the basics like please, thank you, excuse me and where are the toilets (not “bathrooms”! ), but fortunately many people speak English and the language barrier isn’t too tough to navigate. While it’s standard to tip 20% in the US, Italians are paid normal wages in service positions and you don’t need to tip nearly as much. Anything more than 10% really isn’t necessary. Luckily, we didn’t have any issues with pickpocketing, but we heard from multiple Italians that it’s something you truly have to be careful of. Keep your important stuff in an area no one else can reach. Be careful where you stop for a cup of coffee or a bite to eat. We made the mistake of stopping for a cup of jo right by the Vatican and ended up being swindled out of 15 euro PER CUP OF COFFEE. So frustrating. On the note of coffee, they don’t have drip coffee like we have in the states. An Americano, which is espresso and water, is the closest thing to it.